The pastors and deacons have been prayerfully considering some changes to Children's Church for some time now. With the start of a new school year, it has been decided Discovery Kids will now include children between Kindergarten and Fourth grade. Butterfly Babies will remain the same. We believe having a small age range will help the teachers teach more effectively and the children to have a better understanding of the materials taught. Middle school is an exciting time of growth, and we want to help our 5th and 6th graders mature in their relationship with the Lord. We believe they can thrive in the regular church service and have created a program to help them practice attentive listening. Each child will be given a sermon notebook to take notes or even sketch sermon related drawing. This will be done for 8 weeks and then there will be a "Pizza with the Pastor" party after church, where the kids will have the opportunity to get to know the pastors better and also be rewarded for their hard work. In order to be eligible for this reward, a child will need to show notes/related drawings at least 5 out of the 8 weeks. If a child needs to miss church for a week, we encourage them to watch the recorded sermon online. There will be an additional surprise bonus for children who complete all 8 weeks! At the end of the initial 8 weeks, we will reevaluate the program to see whether it is something we want to continue long term. Constructive comments are appreciated as we all learn together! For those who do not have children these ages, this is a great time for you to offer encouragement to them. Change is sometimes difficult, but many times it brings substantial growth, as well! At New Life, we provide a fun, safe and loving environment for children to participate in and where parents feel comfortable leaving their child during Sunday worship. We teach about Jesus through Bible stories, music, crafts and games at a level children can understand and enjoy! We understand parents are the primary influence in their child’s life and we will do our utmost to support the entire family in their spiritual growth and development! We understand that it is the parent’s decision to bring their child to Butterfly, Discovery or Ignite Kids. We respect a parent’s decision if they choose to have their child stay with them in the adult service. 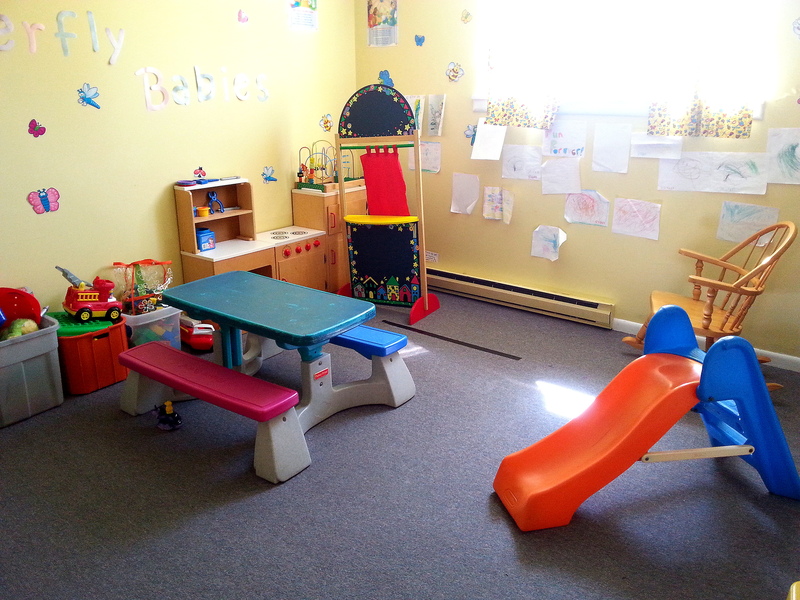 We strive to provide a fun, safe and loving environment for infants and toddlers (ages 4 months – 4 years). We use Bible stories, music, crafts and games at a level infants and toddlers can understand and enjoy! Don’t be surprised to see teachers on the floor playing blocks or soothing a baby by rocking them. It is our mission to aid each child in accepting Jesus Christ, see them filled with the Holy Spirit and help them develop a dynamic relationship with God! We strive to provide a fun, safe and loving environment for early elementary. We use Bible stories, music, crafts and games that all kids can understand and enjoy. It is our mission to aid each child in accepting Jesus Christ, see them filled with the Holy Spirit and help them develop a dynamic relationship with God! During the early elementary years, it is a wonderful time of discovery! We hope that our kids will discover the wonders of God’s truth and grow to love and desire a relationship with Him. We strive to help build the framework of a lifelong faith by allowing the preschoolers to discover the joy of learning the Bible and understanding God’s wonderful truth! Launching on a Mission into God's Word! We are committed to bringing the truth of God’s Word to this generation for Jesus. The heart behind KIDS Church is to have a real relationship with Jesus Christ, not just to know about Him. We “practice” a lot of things from praying to sharing Jesus with our friends. The curriculum is designed to take Bible lessons from the Bible and help apply them to everyday life. God wants to be a part of every facet of our lives. We try to help them understand the importance of giving back and not focusing on only themselves.